Gutters allow the rain to collect off and away from the house, protecting your home's foundation. 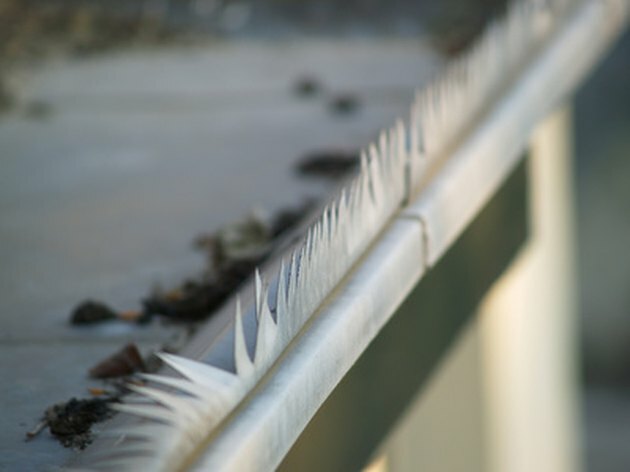 Unfortunately, gutters also collect leaves, branches and other debris that can cause your gutters to become dirty and stained. Cleaning gutters can be a difficult task but it must be performed a few times a year for the gutters to work properly. While you are cleaning out the gutters, you might as well remove the stains to make your gutters look as good as the rest of your home. Rain gutters are an important part of your home that are sometimes overlooked. Equip yourself with a pair of rubber gloves. Gain access to your gutter. Typically, people use a ladder to reach their gutters. Have another person support the ladder while you are on it. Remove all leaves and other debris that are stuck in your gutters. If the debris is thick, use a garden shovel to help remove it. Flush the gutter with your water hose. The water will help push away stuck on dirt, making the stains more visible. Spray an all-purpose cleaner on the gutter stains and scrub with a scrub brush. Alternatively, mix together 4 cups of water with 1 cup of bleach and add 1 tsp. of liquid dish soap. Dip a scrub brush in the mixture and scrub away the stains. The bleach-water mixture will also help to kill any mold or mildew that is growing on or in the gutters. Rinse the gutters with the water hose. How Often Should Gutters Be Replaced?